Get the edge on the competition by checking out the full selection of Splatoon 2's available weapons. Players are pumped up and ready to dive right into Splatoon 2, the sequel to the Wii U's most popular online shooter, set to release later this week on July 21. Fortunately, Nintendo Switch gamers won't have to wait that long to get a taste of the game's available weaponry, as we've got the full rundown of every available Splatoon 2 weapon in each available class listed conveniently below. • Shooters and Blasters - standard fire and ink-spreading weapons. Includes the Splattershot, Splattershot Jr., Splattershot Pro, Blaster, and Splash-o-Matic. Splatoon 2 will also include the new Clash Blaster weapon. • Rollers and Brushes - includes close-range weapons and others sometimes capable of being charged, like the Splat Roller, Octobrush, and Dynamo Roller. Splatoon 2 additions include the Flingza Roller, and the Splat Brella will be introduced in a future update. • Chargers - typically relate to sniper-class weapons. Includes Splat Charger and Splatterscope. 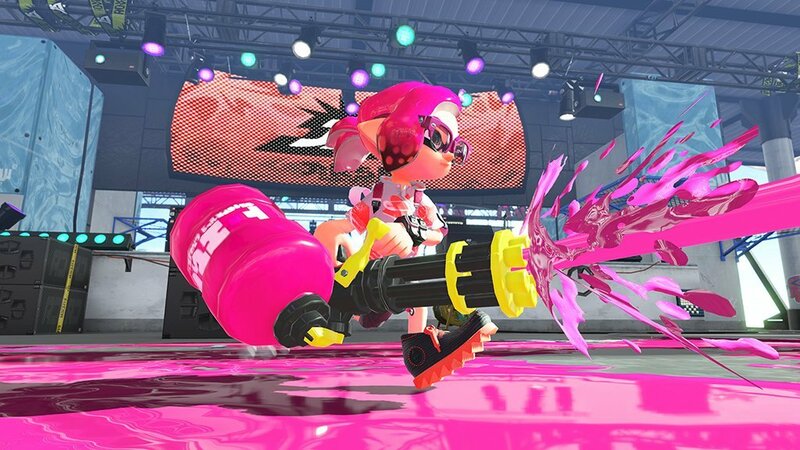 Splatoon 2 will also include the new Goo Tuber charger weapon. • Sloshers - basically buckets of ink, great for covering large surfaces. Includes just the Slosher. • Dualies - the new weapon class in Splatoon 2, offering players the chance to shoot and dodge. Includes the new Splat Dualies and Dapple Dualies. • Brellas - deployable shields that can block incoming fire. Includes the Brella. • Autobomb - a mobile, automated bomb, new to Splatoon 2. • Burst Bomb - a standard bomb that explodes on impact with surfaces. • Curling Bomb - ink-filled bombs that slide across surfaces before exploding, new to Splatoon 2. • Ink Mine - explodes in proximity to enemy players, covering the area in ink. • Point Sensor - works like a standard UAV, displaying enemy locations for the player and their teammates. • Splat Bombs - basic grenades that provide a moderate explosion of ink. • Sprinkler - sprays a continuous stream of ink in its immediate area. • Squid Beacon - a deployable device that allows allies to jump to its location. • Suction Bombs - small bombs that stick to nearby surfaces. • Toxic Mist - a new weapon that disperses a slowing mist. Functions similarly to the Disruptor from the original Splatoon. We've got loads of other great Nintendo Switch titles featured on our list of the Best Nintendo Switch Games.